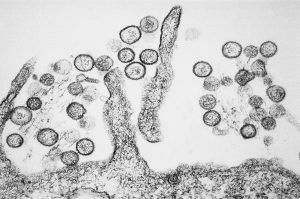 Some of the country’s leading hantavirus experts are studying it from highly secured labs at the University of Washington in South Lake Union. King County officials are waiting on confirmation of another case of hantavirus, which would be the third since November. A woman from Redmond was diagnosed with it in November. In February, a man in his 30s died of it. He lived near Squak Mountain, where the third suspected case also originated. Recently, a woman in her 50s presented symptoms of the virus. She is currently hospitalized. Officials expect to receive confirmation of her illness later this week, but they suspect hantavirus. The virus is called an emerging virus, because it is transmitted from animals to humans. Kell and her colleague, Michael Gale Jr., study the hantavirus at UW. The virus affects blood cells in the lungs, and the body’s response is often more damaging than the virus itself. “Those cells are sending out alarm signals, distress signals, for other immune cells to come to the site of infection en masse. So, there’s a large infiltration of our immune cells into the lungs that then causes accumulation of fluid,” Kell said. Hantavirus is often blamed on deer mouse feces or urine and can be spread through dust. Officials believe the spike in cases may be related to wet weather. More rain means more food for mice, as well as a greater likelihood the critters will seek shelter indoors. But it’s still uncertain whether deer mice are to blame in this case. “Some biologists would argue it could be a completely different mouse species. The deer mouse is more prevalent down south than it is here. There are some big questions here, because hantavirus, maybe it’s adapted to a new rodent species. I don’t know the answer to that. That’s a very important question,” Gale said. Another question: Why doesn’t the virus hurt rodents but can kill humans? “Understanding the molecular basis of that difference could lead to successful treatments. If we could make the human more like the deer mouse,” Gale said. The hantavirus kills one-third of those infected. King County officials are warning people to reduce exposure to mice, especially when living in wooded areas. Symptoms of hantavirus include fever and chills, muscle aches and headache, fatigue, nausea, vomiting, diarrhea, and belly pain. The earlier patients seek treatment, the more likely they will recover.